Millipedes are an atypical companion choice, but if you find these particular creepy-crawlies fascinating, you'll be happy to know they're simple to keep as pets and abundant in the wild. Millipedes don't need hours of attention each day, but you may find yourself studying their peculiar behavior whenever you get the chance. Millipedes live in dark places with moist earth. You can find millipedes under just about any rock or log in a natural environment during the warmer months, especially just after a rainfall. Millipedes won't be out and about during winter. 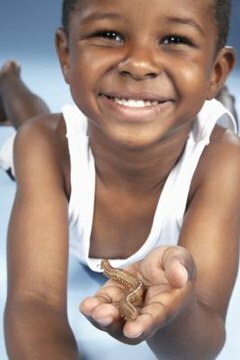 To find your pet millipede, turn over a large rock or damp log and look for some dark-colored, tightly curled creatures. You can scoop your millipede pet into an insect collection jar with a bit of damp soil and keep him there until you get him into his new home. A terrarium is the best set-up for your millipede. A glass or plastic aquarium, or even a plastic storage container, works well. The terrarium should be at least three times as long, wide and tall as your millipede is long. Your terrarium will need a layer of substrate, rocks and logs under which your millipede can hide. Plain potting soil free of pesticides and fertilizers makes good substrate. Mixing 1 part vermiculite for every 10 parts soil helps keep it aerated. Adding a layer of pet store mulch or gravel under the soil also keeps it from turning to mud. You can add ornamental plants to your terrarium, although these aren't necessary. Your terrarium must have air holes so gases can be exchanged but not so large that your millipede can escape through them. A tight-fitting lid on your terrarium keeps your thousand-legger contained. Mist your terrarium daily with dechlorinated water to keep the soil moist. Millipedes eat decaying vegetation, so you'll need to provide this in their habitat. Fruits and veggies, especially leafy greens, are good choices for your millipede. Simply leave the food in the terrarium for a few days; when it starts to break down, the smell of rotting vegetation will draw your millipede to his dinner. Use a field guide to identify the species of millipede you have found so you know whether it is a herbivore or carnivore. Most millipedes are herbivores, but if your millipede is carnivorous, you'll need to feed him animal protein, for instance dead flies or crickets. Millipedes are mostly nocturnal, so don't expect them to do much in the daylight hours. If you want to observe your pet millipede in its active time, you can cover the light of a flashlight with a piece of red cellophane and use that to observe your critters. The red light will allow you to see but won't disturb your millipede. Millipedes hatch from eggs. The mother millipede cares for the hatchlings for a short time before they set out on their own. Millipedes grow by molting -- they shed their exoskeleton and form a new one -- so if you see what looks like a dead millipede in your terrarium, don't be alarmed. Each time a millipede molts more segments are added to its body, so keep this in mind when choosing the size of your terrarium. Millipedes can live several years and grow throughout their lives.